Scooters, bikes, and other conveyances for fresh legs. I wrote a post a few weeks back about the Like A Bike, a bicycle without pedals. The idea seemed a good one to me, but even though it's beautiful, the price tag ($279) seemed a bit high. Then I finally got a copy of the DWR jax catalog in the mail yesterday, and lo and behold they're selling the Like A Bike. So I guess a pedal-less bike isn't exactly as unusual as I thought. Oh well. 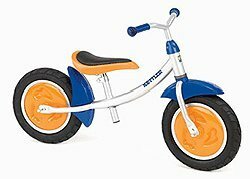 But that post did generate a lot of interest and introduced me to some new scooting options for your kids. MDD reader Kevin pointed me to the Kettler Scoot Training Bike (pictured here) which pretty much looks like the same thing as the Like A Bike, but more like a regular outdoor bike. And they even sell it at Amazon for $89.99. I was also contacted by Randy from Glider Rider, a German version of a similar product. I can tell from our correspondence that Randy is really passionate about balance development, and his product seems like it will do the trick. Apparently they're quite popular in Europe, and in the states the Glider Rider will run you about $127..
Then the other day a good friend of mine emailed me about this cool little scooter his folks had gotten his daughter - the Svan Scooter (made by the same people who make that sweet Svan high chair). 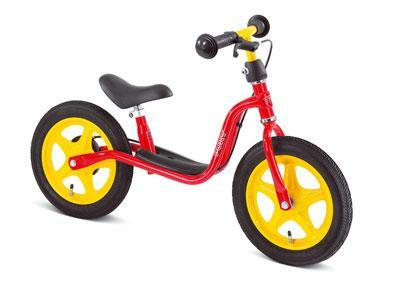 It's not exactly a balance toy, more like a simple, perfectly simple, indoor tricycle. The front of it has no handlebars, but a wheel that pivots while the two wheels in the back are fixed. This lets your kid just push it to the left or right to go where they want. 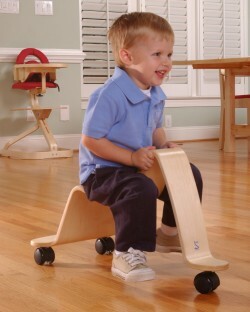 The wheels are rubber (so it's safe and quiet indoors) and it's made out of beautiful molded plywood. The Svan Scooter just came out this November and it's $118.99 from Amazon.com. So there are some options, but I have to say that Svan scooter just jumped to the top of Madame's wish list (thanks Jamie).